Toothy® Task Kits- an original idea from Angie Olson at ©Lucky Little Learners, LLC. 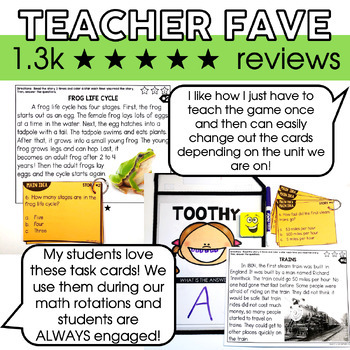 Your students will receive all the practice they need to practice their reading skills through the use of these Reading Task Cards! There are a total of 308 passages, short stories, and scenarios included in this bundle. All of these are written with a 1st grade text complexity level. The answers on the back of the cards allow for these activities to be self-paced and self-correcting. Answers can be written on a Toothy mat, recording sheet, marker board, or notebook paper. 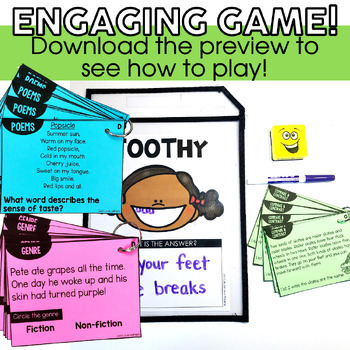 This activity can be done independently, with a partner, small group, or whole group. 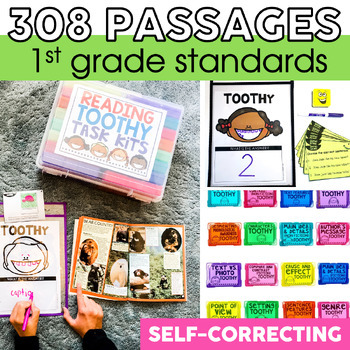 We also have a Grammar Toothy Bundle, Math Toothy Bundle, and Phonics Toothy Bundle! 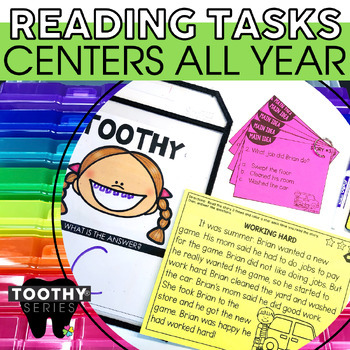 These Toothy Task Card Bundles are specifically designed for 2nd grade! Each partner gets a Toothy mat and dry erase marker. Students will take turns choosing a card. Each student who is playing the game will solve the problem on their Toothy mat or dry erase board. When all who are playing have answered the question, they compare their answers and then turn the card over to check to see if their answer is correct. Those who have a correct answer get to draw a tooth in Toothy’s mouth on their mat. If the student’s answer is incorrect, they do not draw a tooth and those who got the answer correct must explain how they got to the correct answer. Then the next student draws the next card and the process is repeated. The game is over once all the cards have been answered. The student with the most teeth in Toothy’s mouth is the winner of the game. Please download the preview file to take a closer look at what is provided in this resource.